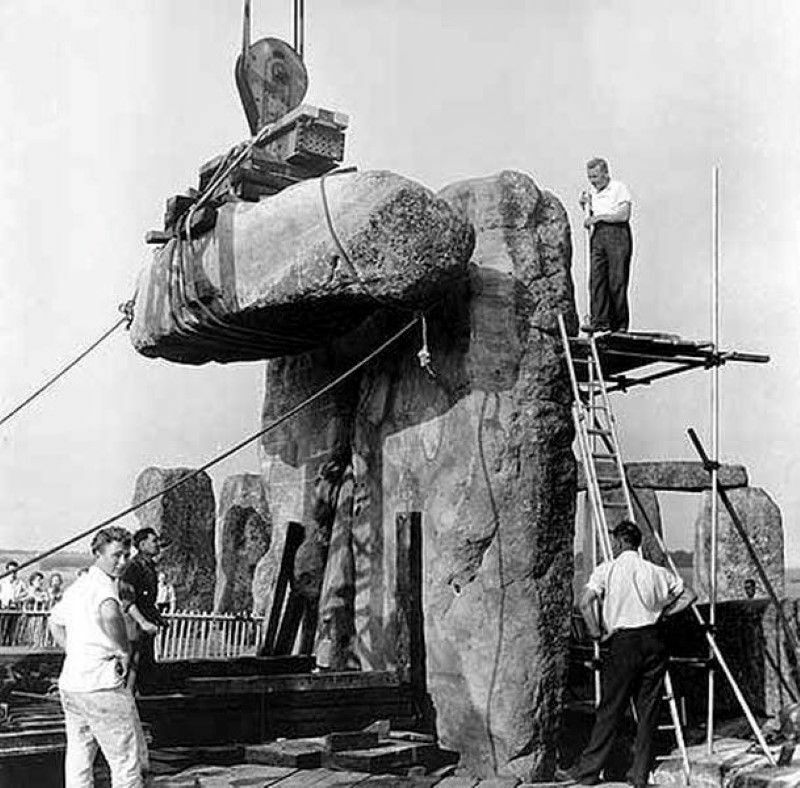 This is one of the dark secrets of history archaeologists don’t talk about: The day they had the builders in at Stonehenge to recreate the most famous ancient monument in Britain as they thought it ought to look. From 1901 to 1964, the majority of the stone circle was restored in a series of makeovers which have left it, in the words of one archaeologist, as ‘a product of the 20th century heritage industry’. But the information is markedly absent from the guidebooks and info-phones used by tourists at the site. Coming in the wake of the news that the nearby Avebury stone circle was almost totally rebuilt in the 1920s, the revelation about Stonehenge has caused embarrassment among archaeologists. English Heritage, the guardian of the monument, is to rewrite the official guide, which dismisses the Henge’s recent history in a few words. Dave Batchelor, English Heritage’s senior archaeologist said he would personally rewrite the official guide. ‘The detail was dropped in the Sixties’, he admitted. ‘But times have changed and we now believe this is an important piece of the Stonehenge story and must be told’. A million visitors a year are awe-struck as they look back in time into another age and marvel at the primitive technology and muscle-power which must have been employed transporting the huge monoliths and raising them on Salisbury Plain. They gasp as they are told about this strangely spiritual site…. mankind’s first computer, its standing stones and precise lintels, lining up magically and mysteriously with the heavens above and the solstice suns. The guide book ‘Stonehenge and Neighbouring Monuments’ , and the audio tour of the Henge omit any comprehensive mention of the rebuilding in the 20th Century. Only on page 18 is there a slight reference…’A number of the leaning and fallen stones have been straightened and re-erected.’ But even that official guide book does not contain clues to the large scale restoration, which was not deemed worth a full entry. Why does John Constable’s 1835 painting of the Henge on pages 18 and 19 look so vastly different from the latter-day pristine photograph across pages 28 and 29? REASON: A lot of restoration work had taken place in between the two images being recorded. And, during long hot summers it would be possible – if one could get near to the stones – to see the turf peeling back to reveal the concrete boots into which the majority of the stones are now set. A dead give-away, but difficult to spot now as proximity to the Henge is limited. Part of this article was written by Roger Taverner and originally featured in ‘The Western Daily Press’ 8/1/2001. Pictures appear courtesy of The Wiltshire Archeological Society and Christopher Chippindale.